The press coverage of the Higgs boson findings has been fascinating. Something that couldn’t be more esoteric has become a big media story, despite so few people fundamentally understanding it. And those of us who don’t really understand it still recognize it as an important news event, simply because we’ve been told it is, and because so many news outlets have discussed it. 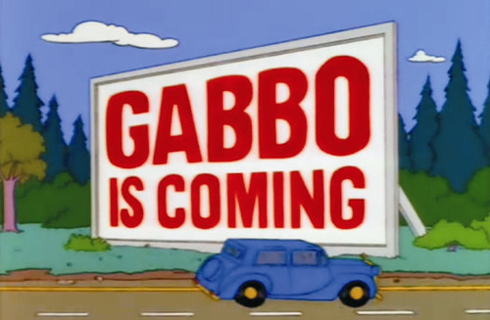 It reminds me of that Gabbo episode of The Simpsons, where advertisements for Gabbo fill the town with excitement and anticipation culminating in a great fervor of interest at Gabbo’s debut, despite no one knowing what Gabbo was (he was a ventriloquist act). Higgs boson! I don’t mean to downplay the significance of their research; what it means is that those nice physicist folks have found strong evidence to support a fifty year old theory of everything, relating to why different subatomic particles have different mass, and ultimately why anything has mass at all. It’s really fascinating, and despite having read a few of books that discuss such things in layman’s terms, I can’t say that I really, truly understand that stuff. The real mystery is why my Facebook friends suddenly have a budding interest in theoretical particle physics. The answer is Gabbo.